And here we are, the 2016 NFL season is finally here. It all kicks off this Thursday night in the Mile High City. Which franchises will get their seasons off to the right start with a victory? It is time for my NFL predictions for the opening week of the season. The path to victory in Super Bowl 50 for the Broncos was the defense and the stop unit should be strong yet again and it is a unit that can and will keep them in any game this season. 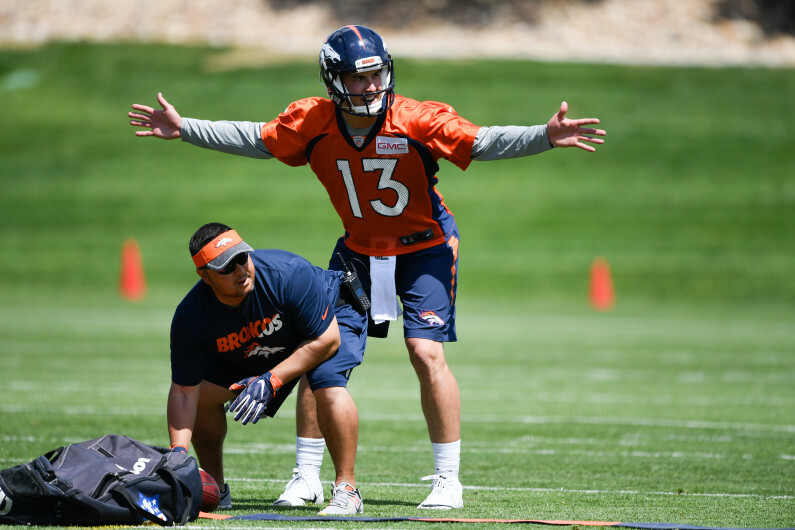 That said, does anybody know what to truly expect from unproven quarterback Trevor Siemian this season? And especially against a very strong front seven of the Panthers, while also dealing with a weakened offensive line? Doesn't seem like a winning strategy for this game. Frankly no matter who the Vikings had at quarterback for this game in the wake of the Teddy Bridgewater injury, whether it was Sam Bradford, Shaun Hill, Joel Stave or even the great Spergon Wynn, I was probably going to pick them here on the road against an inferior Tennessee club. Hill will start and at least he has a firm grasp of the offense and he could just hand the ball off to Adrian Peterson 25 times. That sounds like a solid strategy against a bad Tennessee team. My goodness, what a barnburner. Now that Sam Bradford is now a member of the Minnesota Vikings, Carson Wentz is now expected to be under center a lot earlier than many expected. I'm not sold on how ready he is to be starting from day one but fortunately for him, this Cleveland team is atrocious. I like Philadelphia to win this one at home. Coming into the 2016 season, I'm not all that hot on either club to really push the action and get in the playoff mix but in a weak division, you never know. This should be a good one as each team becomes increasingly quarterback-driven and neither team is all the way there defensively but for me, I think the friendly confines of the Georgia Dome and a big performance from Matt Ryan will be the difference. 2015 truly was about as bad it could have gone for the Ravens but hopes are higher this season as their key players are all back healthy this season. But I like the road team in this contest here in the Bills. I think they can find success running the ball with LeSean McCoy with Tyrod Taylor making some plays in the passing game and crank up enough offense to pull off a win in the Charm City. The Bears should be able to make this interesting, particularly if Jay Cutler can take care of the football, but I don't think this is a great matchup for them. Their defense is still very much a work in progress and now the Texans feature a lot of speed on their offense, as well as a new big-armed quarterback to take some shots down the field. One of the better games of the day will take place here in the iconic New Jersey Meadowlands in this matchup of playoff contenders. I do like the Bengals here to win on the road. First off, we do know how good the Bengals and especially Andy Dalton are in that early game and second, I'm not sold that the Jets offense will be quite as good if Ryan Fitzpatrick is not as good as he was a year ago (which I don't see happening). We have talked about it at-length about how the Raiders are one of the chic teams this year in the National Football League and I think you will see them showcase why this Sunday in the Big Easy. The Raiders have a nice combination of a balanced offense with solid action in both the passing and rushing game and some quality playmakers defensively. While the Saints will always be able t ocrank up some offense with Drew Brees under center but a defense that is still awful will hinder their efforts here and all season long. A classic AFL rivalry, and a very good modern NFL rivalry to boot as well, this game could be pivotal in what may just be a wide open AFC West. I do think that the Chargers are poised to rebound this season from a mess of a 2015 campaign thanks to a rash of injuries but that said, it is never easy to go into Arrowhead and I think that the Chiefs, especially as Jamaal Charles looks ready to roll in the backfield, are the superior ballclub. The Packers are the favorite here and they should be, they are the better team. But they better not sleep on a rising Jacksonville club here in the River City. Blake Bortles has got some weapons to push the action offensively both out wide and in the backfield and while the defense is still a work in progress, there are some pieces there as well. Look for this to be a good game this Sunday with the Pack coming out on top. The picks sometimes do come this easy. Yes, the Seahawks may not be as invincible at home as they have been in the past as they were only 5-3 there this past season. And yes, they may yet be hope for the Dolphins under new coach Adam Gase. That said, Seattle is still very good and the Dolphins, well, are not at all. Therefore, the Seahawks are my Lock of the Week. Now that he's fully healthy once again, I think that Andrew Luck may be ready to tee off on opposing defenses. Granted, the offensive line is still a work in progress as is the running game but hey, we're talking about Andrew Luck. This may just turn into a shootout considering neither team is all that stout defensively but in that case, I have more confidence in Luck and his weapons than I do in Stafford and his weapons. Now that Dak Prescott will be under center for the Cowboys instead of the injured Tony Romo, my outlook of this contest has changed. There is no question that Prescott looked pretty darn good in the preseason but going against simplified defenses in the preseason is a little bit different from regular season action and even with a strong offensive line and running game, I think he may just struggle against an improved Giants defense. I like Eli Manning and New York to crank one out on the road. Without question this is the Patriots' toughest contest during the Tom Brady suspension, going on the road to take on one of the better clubs in the NFC and one that features an aggressive defense to boot. I think that Jimmy Garoppolo will do just fine while Brady serves out his suspension given how familiar he is at this point with the offense but on the road against a team like this, this would really take an impressive performance out of him. Although they have struggled with the homefield advantage in recent years, Washington did bounce back this past season by going 6-2 in the friendly confines of FedEx Field. That said, I don't love them here to pull the upset against the Steelers. Even as they did bring in Josh Norman, I'm not convinced that their pass defense is good enough to keep coordinator Todd Haley's attack at bay and especially not if the pass rush isn't cranked up. Featuring only the two clear worst teams in the nightcap, while the Niners may have the homefield advantage, the Rams do have the talent advantage. After all, they do have a pretty good back in Todd Gurley and the best defensive line in the league. That said with Case Keenum starting, everything is off the table. Then again, he is going against Blaine Gabbert so how bad could he be compared to the competition? you one of those libtwit nancyboys that won't say REDSKINS either? hack...classic "oh look at me i'm righteous"
Much as I hate to admit it, your LOTW is about right. My Dolphins won't enjoy their trip up to the NW given that the Hawks won't be nice hosts. Might as well get used to getting walloped as it will happen a lot this season. I may be wrong but weren't the Redskins 6-2 at home?? If upsets were so easy to predict then they wouldn't be "upsets". I would love to think the Dolphins could upset Seattle - but pure logic dictates a Hawks win by plenty. Of course X factors like key injuries, a bad umpire call, a freak turnover for six etc. could work in Miami's favour, but the probability is low and Miami is a poor outfit anyway. That said there are always 3-5 unexpected results most weeks in the NFL. BTW, I meant to say the Chargers defeat the Chiefs, not the other way around...along with the Lions, Bucs, and Titans winning. Never easy to predict, but you gotta pull the trigger and we aren't even talking monumental upsets by any stretch. It is like watching all the ESPN "experts" advance the higher seeds deep into their mock brackets after the selections are made for March Madness. I don't understand the point if you can pretty well predict what someone else is going to predict, because it is all chalk: and it NEVER goes down as such.